Apple finally—finally!—updated its high-end laptop with new keyboard functionality, processors, and more. It’s been rumored for some time, and it even made an appearance in the macOS Sierra 10.12.1 update, but on Thursday Apple officially revealed a new MacBook Pro. The killer surprise-and-delight feature? It’s called Touch Bar, an OLED panel that replaces the row of function keys usually found on the top of the Apple laptop keyboard. 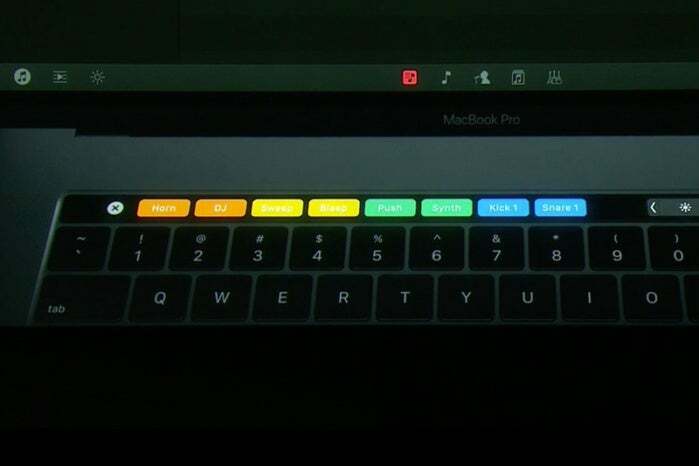 The functions provided by the Touch Bar change based on the software you are using. For example, if you’re using iTunes, the Touch Bar lights up with icons representing player controls. During a chat, the Touch Bar can be used to instantly place emoji. In the Photos app, you can access editing functions on the Touch Bar and apply those edits to the photo you’re working on. Adobe Photoshop can use the Touch Bar to perform image edits. Customizing the Touch Bar can be done using drag and drop. You can select the functions you want on the main screen, and drag them to the location your want off the bottom of the MacBook Pro’s screen and onto the Touch Bar. 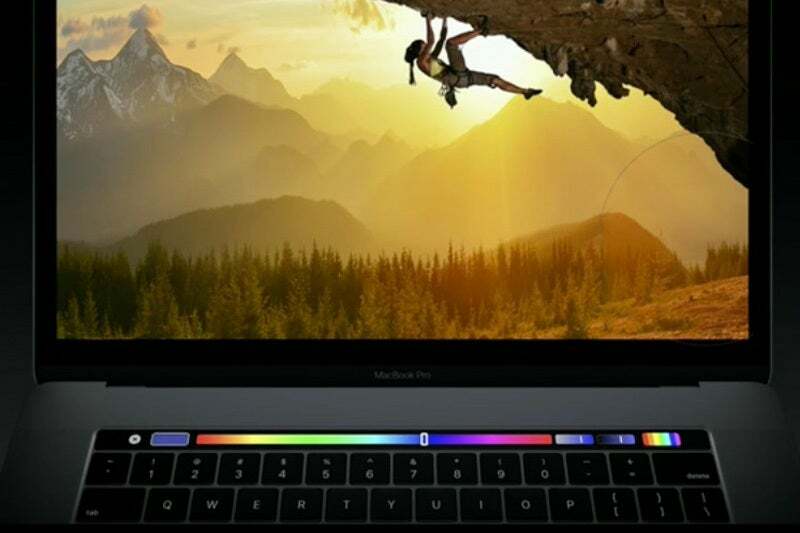 During the Mac event, Apple said that third-party software developers will be able to create Touch Bar controls for their software. Adobe showed how the Touch Bar can be used to perform image edits in Photoshop. Algoriddim demonstrated how a DJ can use the company’s Djay software and the Touch Bar to perform mixes. Apple’s Phil Schiller also said that Microsoft will be offering Touch Bar tools for Microsoft Office. Apple also updated the Force Trackpad, which is now double the size of the previous trackpad. The new keyboard takes its cues from the 12-inch MacBook; the MacBook Pro keyboard is is based on butterfly switch technology, but Apple called this a “second generation” butterfly switch that’s more responsive to better suit the demands of pro users. The all-aluminum case design of the new MacBook Pro is thinner and lighter, and available in silver and space gray. The 13-inch model is 14.9mm thin, 23 percent smaller than the previous 13-inch model, and 3 pounds. The 15-inch model is 15.5mm thin, 20 percent smaller than the previous 15-inch model, and 4 pounds. To help cut down on the weight and size on the MacBook Pro, Apple shrunk down the size of the speakers. But according to the company, there’s no sacrifice in audio performance; Apple claims that the speakers have twice the dynamic range, 58 percent more volume, and 2.5 times more bass response than its predecessor. The MacBook Pro relies on Thunderbolt 3 ports for connectivity. The most drastic change is to the ports. Apple is going all in with Thunderbolt 3, providing multiple Thunderbolt 3 ports on the MacBook Pro—there are no USB-A ports. There’s also no MagSafe adapter port; charging is done through Thunderbolt 3. The MacBook Pro’s Thunderbolt 3 support USB-C, so users can still connect their USB devices, but you’ll need a USB adapter. While it seems like Apple is doing what it can to make the headphone jack obsolete, it still lives on the MacBook Pro—it’s the only other port type featured on this new machine. The MacBook Pro no longer has an HDMI port. The SD Card slot is gone, too. According to Apple, the LED-backlit IPS displays in the new MacBook Pro are now 67 percent brighter, have a 67 percent higher contrast ratio, and can display 25 percent more colors than previously. The displays offer 500 nits of brightness and support for the P3 wide color gamut. The 13-inch MacBook Pro has a 2560-by-1600 native resolution (227 pixels per inch), Supported scaled resolutions are 1680 x 1050, 1440 x 900, and 1024 x 640. The 15-inch MacBook Pro has a 2880-by-1800 native resolution (220 pixels per inch). Supported scaled resolutions are 1920 x 1200, 1680 x 1050, 1280 x 800, and 1024 x 640. 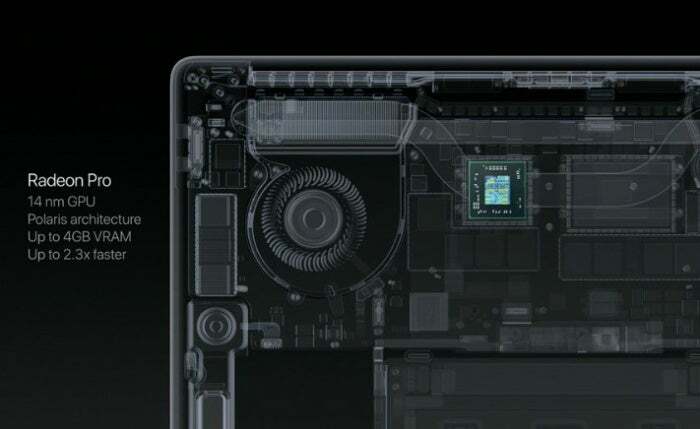 The 15-inch MacBook Pro uses AMD graphics processors. The 15-inch model uses an AMD Radeon graphics cards. The standard configuration uses a Radeon Pro 450 with 2GB of graphics memory and can run two external 5K displays. Apple offers buyers the option to upgrade the graphics to a Radeon Pro 460 with 4GB of graphics memory that and run up to four 4K displays. The 13-inch models have Intel Iris Graphics, which are integrated with the main CPU. The low-end Intel Iris Graphics 540 can run one external 5K display, which the Intel Iris Graphics 550 can run two 4K displays.